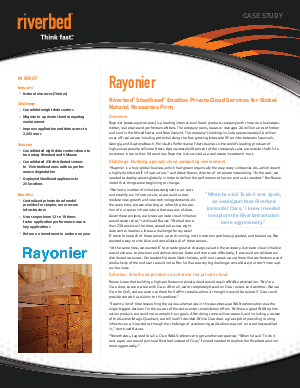 Rayonier, a leading international forest products company, chose Riverbed Technology for a global WAN optimization solution in order to make its private cloud a reality. With Riverbed, Rayonier was able to consolidate and virtualize eight data centers down to two, without diminishing end-user performance or adding bandwidth. The success of this project enabled Rayonier to payback its Riverbed investment in less than one year. Payback on the Riverbed investment was less than a year. Users now experience 12 to 18 times faster application performance across key applications. Download the case study to learn how Steelhead solutions can accelerate your organization.